This offense can be used against man-to-man, zone or box-and-one defenses. If it is used against a box-and-one defense, 4 must be the player defended man-to-man. 1 dribbles in either direction, preferably away from 4. This takes away the entry pass, which can cause some problems. 2 goes to the low block to screen for 4, who breaks to the corner. 5 goes to the ball side elbow. 1 has the option to pass the ball to 4 for a shot, 2 on the low block, and 5 at the high post. 3 covers weak side rebounding. If nothing is open ball is reversed to 5, who pops out to receive a pass from 1. 2 sets a screen for 4, then releases to the opposite wing while 3 is setting screens for 2 and 4. 5 rolls to the ball side elbow. 1 covers weak side rebounding. 2 has the option to pass the ball to 4 for a shot, 3 on the low block, and 5 at the high post. Ball is reversed to 5, who pops out to receive a pass from 2. 3 screens for 4, then releases to the opposite wing. 1 sets a screen for 3 and 4, who continues along the baseline. 2 maintains position for weak side rebounding. This offense is effective when you don't have a good center, but have decent shooter with other players who can pass, screen and move. 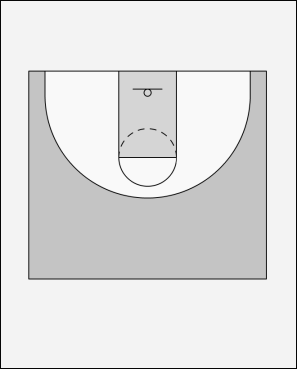 It is most effective if the center can shoot from 12 to 15 feet and can handle the ball. The benefits of the offense are 1, 2 and 3 are interchangeable (basically running the same pattern) and the entry pass from the point to the wing is eliminated.